Advertising | The greatest WordPress.com site in all the land! 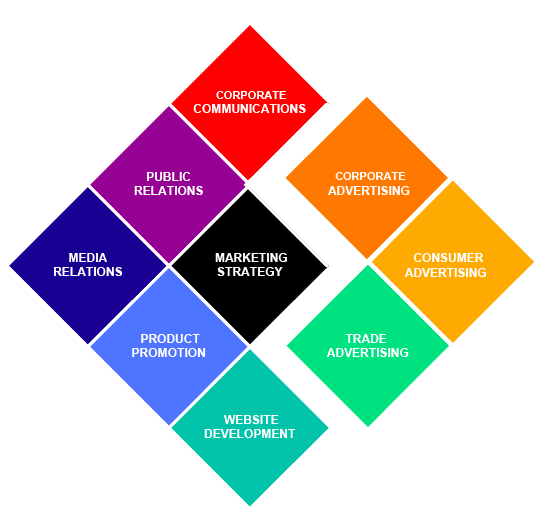 To most of the business world, marketing, advertising and public relations are separate disciplines – but in reality, all marketing disciplines work best when they work together in an integrated marketing campaign, focused sharply on your business and financial goals. Advertising in traditional media or online can point new prospects to your website, extend and reinforce a business news placement, or draw traffic to your trade show booth. That’s why DesignMarks offers award-winning advertising along with all the other critical marketing disciplines – and a fully integrated strategy for using them to your best advantage. When semiconductor companies began putting millions of circuits on a single chip, their designs and chip prototypes began failing repeatedly. The individual circuit cells and pathways only millionths of a meter in size (“ submicron”) were experiencing new physical interference problems. Avant! developed a new ASIC (Application-Specific Integrated Circuit) design system specifically for these challenging “deep submicron” chips. It solved the new physical magnetic effects and timing problems. Moreover, it simplified and accelerated the design process, saving many months in critical speed-to-market. The agency had to sell the Avant! system to technology companies deeply committed to their current design systems. 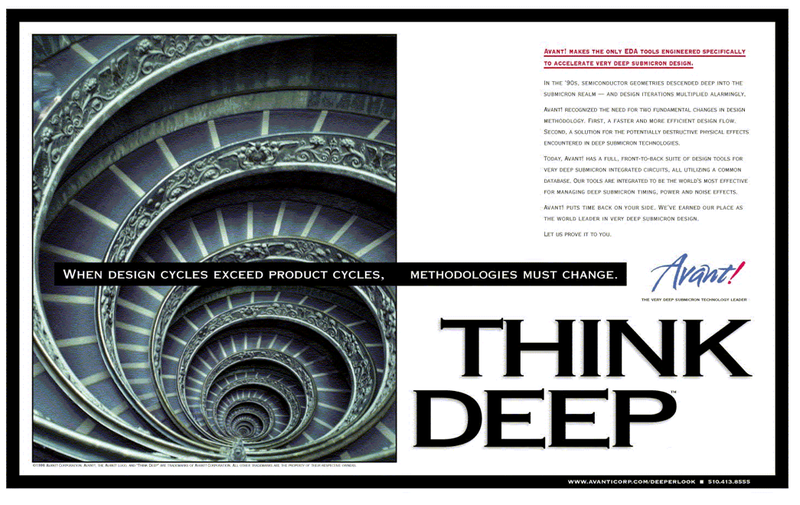 Our “Think Deep” campaign boldly challenged the traditional design philosophy, successfully introducing the new design system. The company’s design technology was later challenged in a legal patent suit – but the ad campaign was unchallenged in creativity. It received the top Silicon Valley ADDY creative award in the Business/Trade Print category. Mercury Interactive makes software that tests the big, complex software that enterprises create for themselves. Our client already had 80% of the software testing market, selling individual testing tools to corporate software engineers. The only way to get more sales was to expend the entire market… so the client’s ambitious strategy was to make “comprehensive software testing” a top management policy. Our creative assignment: Get software testing out of the IT basement and up into The Boardroom of global enterprises. The art director found these striking photographs in a photo magazine and we wrote headlines and copy bridging the images to the issues of software testing. The ads were striking in technology media and so effective running in 1998 that the campaign was extended through 1999 to capture the emerging e-commerce market. The campaign was later honored as “Best of Show” in the Silicon Valley ADDY Award competition versus all the year’s creative work by the Big Name – and Big Budget – tech giants. 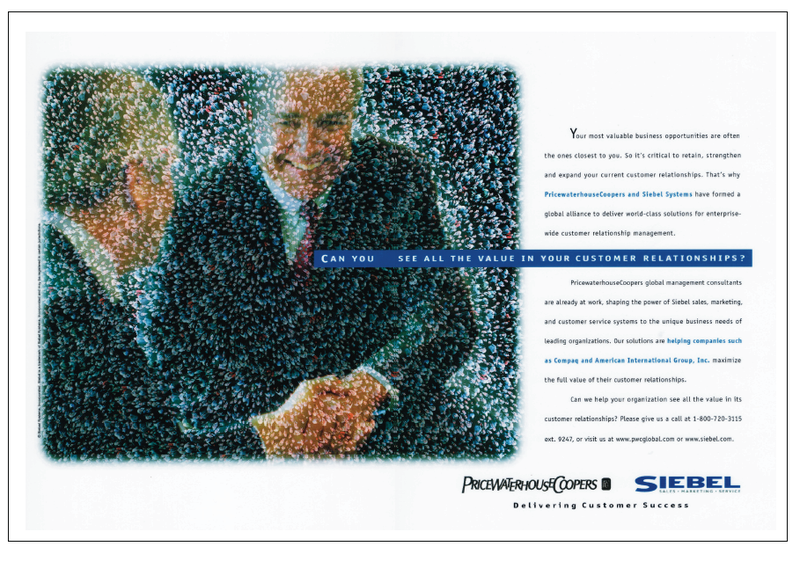 Siebel Systems and Price Waterhouse Coopers (now PWC) had just formed a strategic alliance to market Siebel’s Customer Relationship Management solutions to PWC’s global enterprise clients. The agency was invited to a conference to plan a major Wall Street Journal announcement. Then the argument started. Who’s logo would be bigger? Who’s corporate style would be used? The agency interceded with a suggestion: Instead of a standard formal announcement, why not use the expensive WSJ pages to highlight the benefits of the alliance to their enterprise clients? 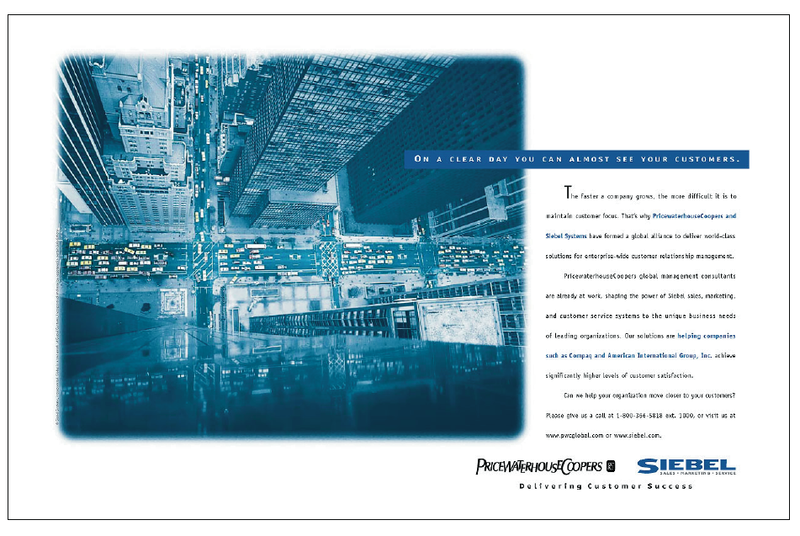 Both companies eagerly agreed… and a week later, approved these full-page, full-color WSJ spreads. The day after the first ad appeared, three CEOs of global enterprises called, fully justifying the massive cost of the WSJ campaign. Regency Savings Bank FSB is a regional financial institution with branch locations throughout the Chicago metropolitan area. Most banks sell similar products at similar rates as determined by the federal government. Our assignment was to find something to set the bank apart from its competition. We settled on two things: the quality of customer service, and the ease of delivering the product to the customer. Over time we produced several advertising campaigns aimed at different market segments with the same demographic area: one was aimed at the general consumer, and another a the home buying audience. Solid Research Combined With Great Creative Produces Results. A good product, or service, combined with effective and through research of the client’s markets is imperative for a successful advertising campaign. However, that alone will not bring in buyers. 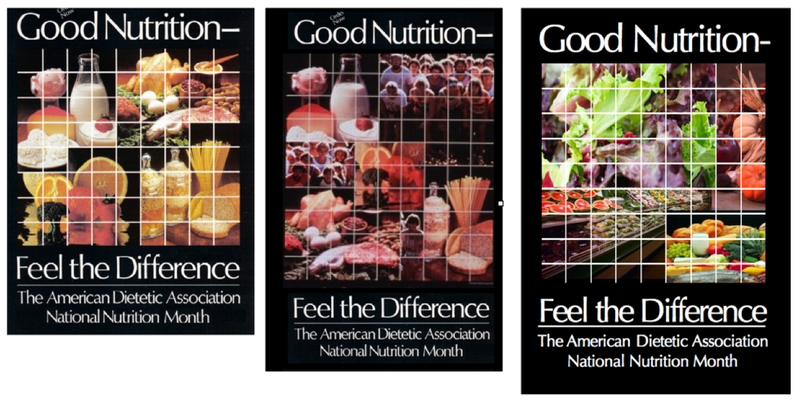 Once the research is in hand our creative team will develop an imaginative way to use this research so that it will be most attractive your niche market – and the American Dietetic Association campaign is an example. The buyer is a continually moving target, and that is why this combination of research, creative writing, and visuals is so important. Not only does the average buyer grow and change, but society and culture change too – sometimes in very different ways. Your product, service, and/or message is important to us – and we strive to give our clients the most creative means of reaching their niche audiences.